Norristown, The Willow School boosted its rating in Pennsylvania’s Keystone STARS program and has been recognized with a STAR 3 designation from the Pennsylvania Office of Child Development and Early Learning. The Willow School provides child care services for approximately 130 children ages 3 months to 12 years. To earn a STAR 3 rating, The Willow School had to meet research-based standards for program quality. For example, all lead teachers in a STAR 3 centers must have at minimum - an Associate’s degree in early childhood education in order to develop and implement effective lesson plans for successful outcomes for young children. Teachers assess children’s skills three times a year, and hold at least two family conferences each year to discuss the child’s progress as well as his/her behavioral, social and physical needs. According to Owner, Kym Ramsey, “ For the past two years, The Willow School teachers and staff have worked extremely hard to reach a STAR 3. We know that quality really makes a difference not only to our children and families, but also to our community and economy. Research has shown that quality early education increases a child’s likelihood to develop a love for learning, attend and graduate from college, and become a successful adult who earns a good salary that affords them the ability to contribute to the tax base of our financial markets. 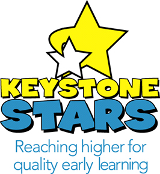 Keystone STARS is a rating system that offers families a way to evaluate the quality of child care programs, so that they can make an informed decision that best suits their needs, as well as the needs of their children. As STAR levels increase from a STAR 1 through a STAR 4, so do the requirements for meeting higher standards of quality. Keystone STARS also provides training to advance staff education, technical assistance to help programs meet STAR level requirements, and additional resources and retention bonuses for teachers to support continued quality improvements. The Willow School in Norristown, PA has earned a higher quality rating and is now a STAR 4 with Keystone STARS!